Configures smartly to adapt to growing families (learn more). Reclines flat with one hand for naps on the go. X-Large basket carries 30 lbs worth of everyday essentials. Folds in one step with or without seat attached (one seat only). 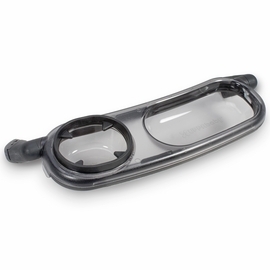 Narrower wheel base reduces the width by 1"
The VISTA is designed to adapt as your family grows. Only its enhancements adjust to changes in life?s momentum ? be it weather, terrain or life stage ? even better than its predecessor. 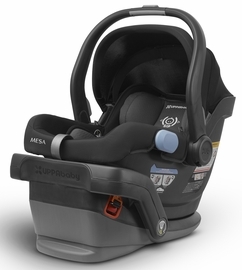 The VISTA can comfortably hold two MESA Infant Car Seats and then it can adapt to two toddler seats (rear or forward facing) plus a PiggyBack! ? All the while strolling like a single. This was a great deal for us and it has proved to be extremely worth the price. We have never had any problems with it and it holds up great. Second uppababy stroller and this one is better than the last. ProsBasinet works great for little ones before they are able to sit up. Folds down nicely and very easily. Love the color combo. ConsSlightly front heavy with a bigger kid up front. This stroller is amazing. I have two toddler boys and live in NYC. We walk everywhere. Bought it when the little guy was 3 months old and have had it for a year. It still feels and looks and moves like it�€™s brand new and it has so many miles on it. 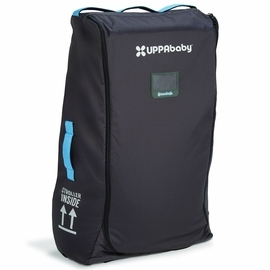 We have used it in nearly every seating configuration and with the uppababy car seat. 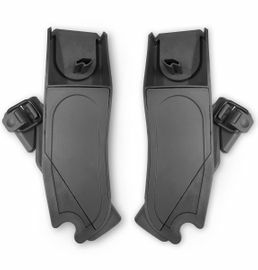 I love the foot pedal break (uppababy- don�€™t ever change that! 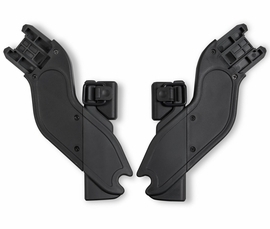 ), the easy fold, and incredible maneuverability. With 75 lbs of kids, plus groceries and diaper bag, it�€™s still easy to get around and I�€™m only 115 lbs. ConsMy 4 year old loves his seat but is surely growing out of it. He?s at the weight limit...but just ordered the piggyback board to help. Just a limitation more than a con. 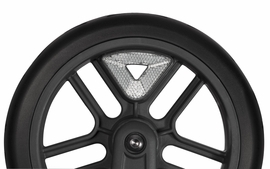 But one real con is that the front wheels, especially with the weight of 2 kids, can not really handle much more than a half-inch of a bump- whether that?s a crack in the sidewalk or bumpy street crossing/curb or even as small as a garden hose. 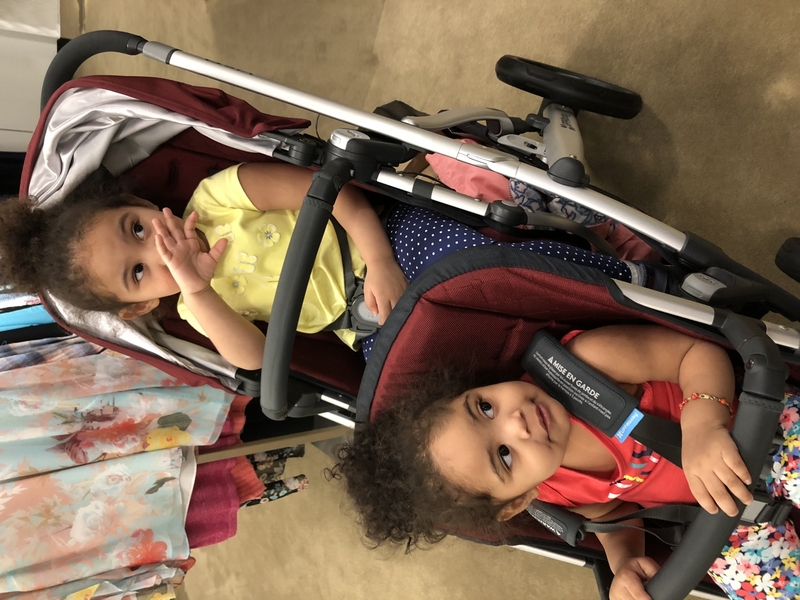 And occasionally, I think it?s bc I walk super fast- the wheels rattle a little like they?re gonna fall off- it?s like the front wheels and the back wheels aren?t going the same speed or something and it jiggles the whole stroller. So I have to lift the handle to pick the back wheels up and that seems to resolve it. 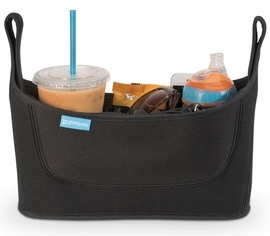 And- as in other reviews - there?s no cup holder that works when you have two toddlers in tow - there?s just no room- and I don?t like the one that sticks out on the side bc I can barely make it through the aisles in the stores as is. So I?ve spilled my coffee a few times. Still worth the amazing stroller. Oh- and it is big when folded and takes up some serious trunk space but that?s just life with two kids. 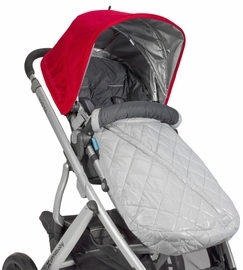 We recently had twins and have been using this stroller with infant car seats on bumpy city streets. So far, it's been great! The kids fall asleep almost immediately despite the rough patches outside. The steering is excellent despite the double seats and the storage space beneath is much needed. We hope the toddler seats will be easy to operate and comfortable once they grow into it. The only criticism would be that the bassinet is bundled and for twins, it is very clunky (and costly) to add a 2nd bassinet. 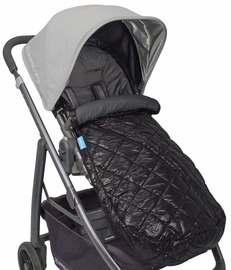 I wish they would've made the bassinet an optional accessory and make the stroller itself a bit cheaper. Best stoller - We love it! I love how easy this stroller is to configure and fold up. My last stroller I would fight with all the time, but this is a breeze! Highly recommend it. Very easy to manueverEasy to put togetherHuge storage basket And my girls love riding on it Still havent used the bassinet since baby isnt due until July but so far my 2 1/2 year old and 18month old love it. This stroller is perfect for twins. It is easy to maneuver and being a tandem fits through doors and doesnt take up a lot of room. I love the bassinets as I can take the twins out on walks along with my toddler and the dog. This stroller is perfect for twins. Its easy to assemble and maneuver. It has an amazing turn radius. Its sleek and not bulky. I cannot tell you how much we love this stroller! Best UsesIt�€™s great for both outdoor and indoor use. It�€™s so easy to put together. 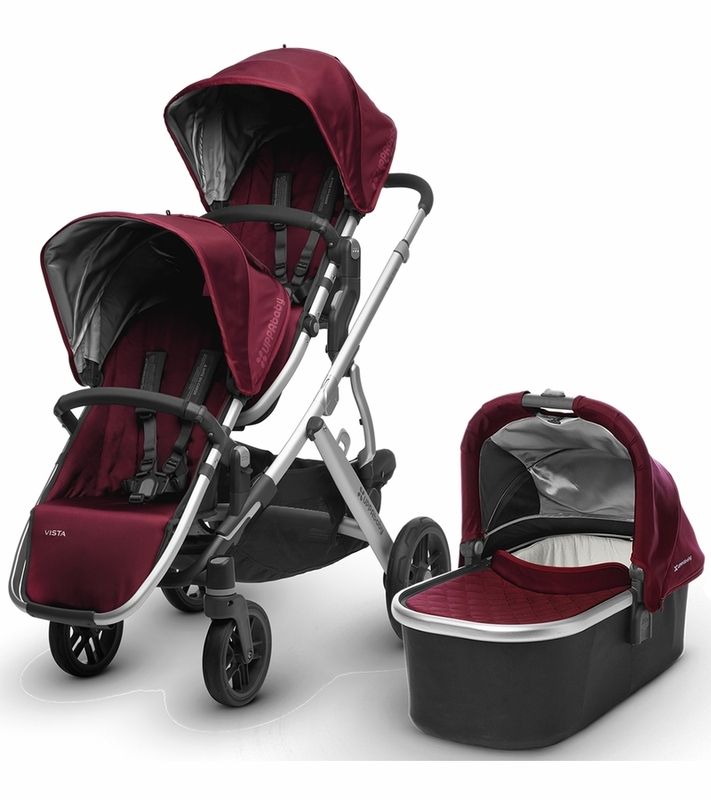 The uppababy vista is the best Stroller on the market for parents on the go with twins! 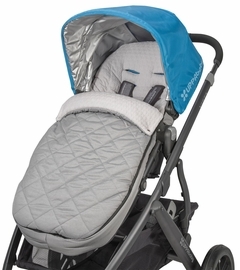 This website has the best price for this particular stroller , I love the fact that it comes with a bassinet which will be very useful for my newborn . Very satisfied, can't wait to use it when I deliver . The prettiest stroller! Works perfectly for my three little ones - and great roomy basket! We did lots of research on double strollers. My babies are 12 months apart and I needed something easy and simple to help me. Love all the different was to change around the seating as they grow. Loved how easily it pushes and how small it folds compared to others. This is the best stroller over ever had. 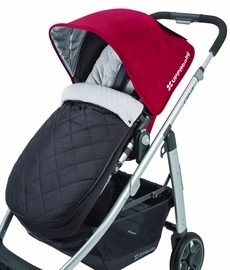 I have gone thru many stroller throughout my 2 kids and I'm glad I found this for my 3rd one. It caters to all of them. Easy to assemble and navigate! I love this stroller, definitely worth the investment! 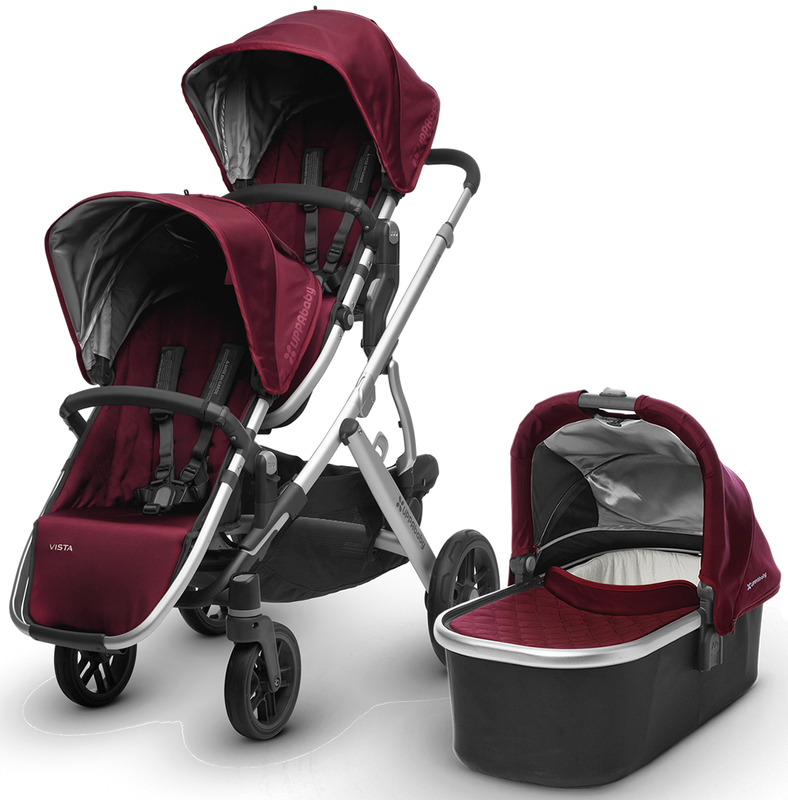 The easiest tandem double stroller to navigate with si many configuration options and a well thought out design! I love this stroller- its super easy to maneuver. I really like the fact that I can make it into a double stroller (or even triple with the piggyback scooter attachment) and that there are tons of seat configurations. The bassinet is great for babys first few months. I can even go on a run with it. I had the 2012 Vista previously and upgraded to the 2017- it seems to be much lighter and the rumble seat has a much better design. Overall, I would definitely recommend this stroller to friends! Best stroller - single or double! This is a fantastic stroller and is worth the investment in my opinion! 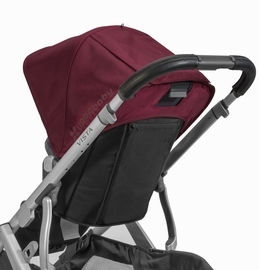 Pros:Sit up and multiple recline positionsSun shadeAdjustable handle barHuge storage basketManeuverabilityRelatively lightDecently small foldConvertible to a double Cons:SuspensionWe have tried the city select lux and BOB revolution strollers and neither compare to this. Our daughter has been picky with her strollers from the start and only wants to sit in one of the seat goes ALL the way upright. 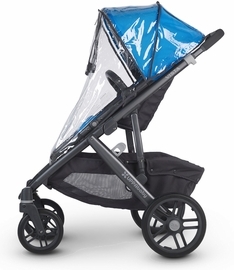 This stroller does just that and has many other fantastic features. Highly recommend. I adore my new stroller!! Exactly what I wanted!! 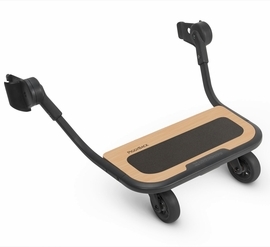 It's so smooth, easy to use, the foot brake is awesome and it's just a great stroller. I'm using as a single stroller now but will soon be using as a double which I am excited about as all parts are easy to put on and take off! Gorgeous stroller, have gotten lots of compliments. Have only used as a single so far (baby #2 due in 4 weeks), but have tried all the possible seating combos to see how they work. ProsVery smooth ride & easy to push. Lightweight too! Love the extendable sun canopies, which is a must down south. ConsRumble seat(front seat) is smaller than the second seat. The front seat sits very low when attached, so you lose some of the storage underneath. 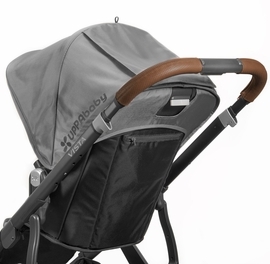 With a second child on the way and a former City Mini GT owner, we were on the fence between the Baby Jogger City Select Lux and UPPABaby 2017 Vista. 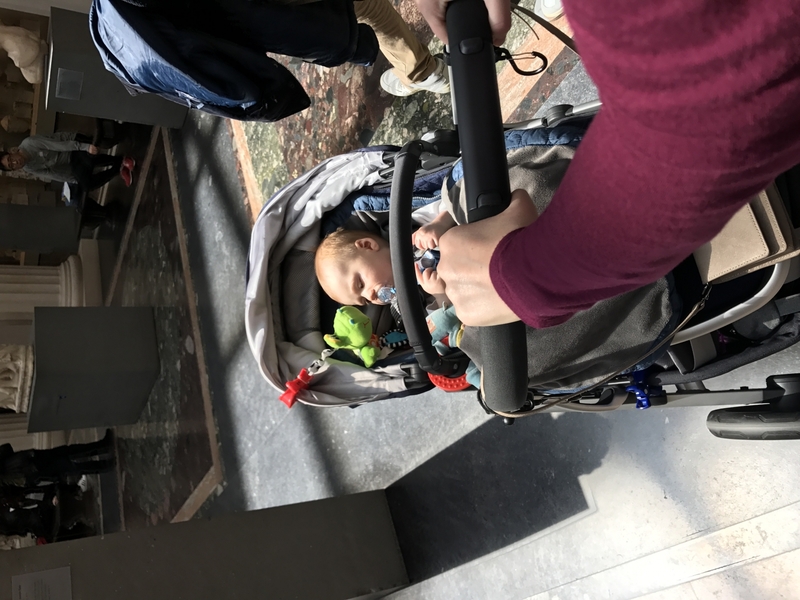 Once we compared the two in person, it was an easy decision...Looking for a compact double stroller is harder than I anticipated, but the UPPAbaby 2017 Vista is exactly what we needed. Great stroller, with many position options. Really pleased the amount of accessories that came in the box for this price point! Only con, does take up much of the trunk space in our SUV when folded. Overall very satisfied with our purchase of the UPPABaby 2017 Vista. We bought this because we needed a double stroller. It's pretty nice! Easy to push... the basket is fantastic! We used to have a Bugaboo and miss the great suspension (Vista has none). 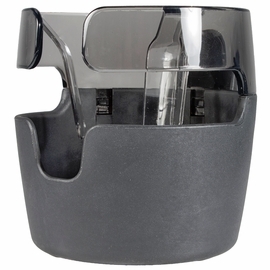 The other great thing is the fold and the fact you can adjust the seat and release the belly bar with one hand. Does this come with the rumble seat? Does all the accessories come with this set to use upper seat, lower seat, and the bassinet? Thank you!